Instead of paint or clay, a raw material waiting to be formed by an artist, Gabriel de la Mora prefers a material with history that maintains traces of its past life. His wide-ranging media includes human hair, worn soles of shoes, old floor tiles, found paint fragments, and eggshells. Repetitive actions become the subject for this body of work — striking 39,675 matches, cutting apart the 793.5 match boxes, all to place the 1,587 sides on the wood panel. 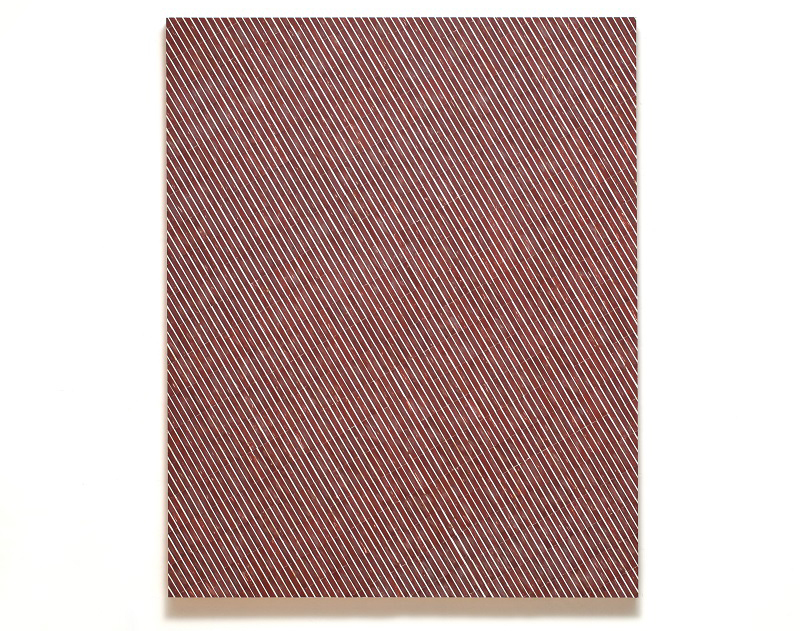 The artist’s obsessive method recalls the particular painting style of Frank Stella in his linear, monochrome canvases, and both works share a similar aesthetic that is a result of this attention to detail. De la Mora’s work is brought to life through imagining the small explosion of the match head and the smell of sulfur, which is evidenced in each scrape on the red surface. The artist lives and works in Mexico City. This work may be installed in either vertical or horizontal orientation.